It’s time to crank up the music, warm up those legs, and prepare yourself for an hour of intense cardio. Indoor cycling, otherwise known as spinning, is a type of exercise that involves a stationary resistant-induced bike. Spinning classes typically consist of large groups with the bikes in stadium like rows facing an instructor. Most “spinners” thrive off of the high-energy classes as they pedal and sweat off the pounds to pumping music. As a first time spinner, the intensity and camaraderie these classes encompass may seem intimidating. Before you indulge in what may become an addicting (and beneficial) workout, become a spinning pro learn everything from the basics of spinning, what to wear and what to expect before you go. You will work up a sweat. And depending on the instructor, fans may or may not be included. You want to be sure you wear moisture-wicking attire to keep your body cool and dry. Stay away from any loose fitting clothing. Wear something that you feel confident in. As for your shoes, you may come across a class that requires cycling shoes. In some cases, studios will allow you to rent cycling shoes directly from them. Most of the time your regular athletic shoes will work perfectly with the straps on the spin bike, which hold your feet to the pedals. Lastly, because you will be sweating up a storm, it is a good idea to bring a small towel to use to wipe off your face and hands throughout your ride. About 30-60 minutes prior to your spin class, try to eat a well-rounded snack consisting of clean, whole foods. For example, you could eat a cup of yogurt, berries and nuts, or sliced turkey with vegetables. More important is that you make sure you are hydrated. Drink lots of water prior, during and after your spin class. Remember, how you fuel your body before to your workout is what drives your performance level during. Your seat height is important. You want to be high enough so your knee extends, but not too high where you are reaching for the pedal. A good rule of thumb for accurate seat height is to position it when one leg is at a 30-degree angle at the bottom of the pedal stroke. Your handlebars should be adjusted so you are not straining your neck or back. The handlebars should not be too close to your body, with your shoulders by your ears, and not too forward where you strain forward; but at a comfortable distance so that you shoulders can relax. Lastly, the distance between your handlebars and seat should be positioned so that your knees are always directly over your forefoot. As a first time spinner, we recommend asking the instructor to help assist getting you set up. Take note of the settings once you are settled in – it will make it easier to set up your bike next class. In order to follow along with the rest of the class without looking like a newbie, become familiar with the various bike positions and terminology. When your instructor says position 1, this is your home, flat terrain pace with your hands on the handlebars (also called the hoods, or brakehoods). This position is usually meant for warm ups, between intervals or cool downs. Position 2 is when your hands are placed on the center bar of the handlebars. You could get into this position when you are climbing, adding resistance to mimic an incline, doing jumps (alternating between sitting and standing), or standing flat, a more relaxed pedal but in the standing position. Position 3 is when your hands are on the outer handlebars. This position is only used for a standing climb. Gear up/gear down, or add resistance: this means turning the resistance knob to increase the resistance or to decrease the resistance of the bike. Sprints: to sprint means you are going to pedal as fast as you can. Most spin classes are anywhere from 30 to a full 60-minutes, allowing you to burn 600+ calories per class. 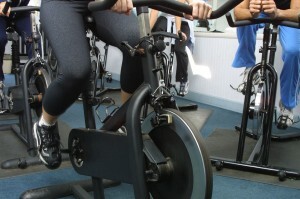 Although every instructor is different, spinning is a high-intensity work out. You will be working your body hard. The music and energy from the class will help motivate you to push yourself, but always be weary of how you feel. Listen to your body and go at your own pace. When trying something new such as spinning, it may seem a little intimating at first. But after knowing the basics and trying it for the first time, you will realize how fun taking a group class can be! ← How Often Should You Exercise?